LONDON (VIP NEWS) — UK Association of Independent Festivals (AIF) now has 50 members, with new additions including The Isle of Wight Festival, Fire in the Mountain and Farr festival. The London based trade association represents UK festival organizers. 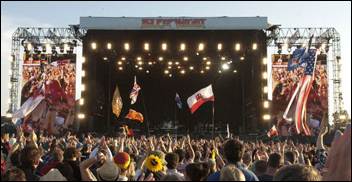 The biggest name to be added to its ranks is the 75,000-capacity Isle of Wight Festival, headlined in 2014 by Red Hot Chilli Peppers, Biffy Clyro and Kings of Leon. It joins the 1,000 capacity Fire in the Mountain held in Aberystwyth, Wales and Farr, a 3500-capacity underground electronic music event held just outside of London. Other AIF festivals who have become members in 2014 include: No Tomorrow in Nottingham (DHP Family, 15,000 capacity), The Eistenfodd held in various locations across Wales (18,000), Gloucestershire’s Barn on the Farm (5,000), Manchester’s Pangaea (6, 500) and Rhythm and Vines- a 30,000 capacity event held in New Zealand and AIF’s first international member. AIF’s 50 members have a collective audience of over 600,000 who contribute over £200m each year to the UK economy. As part of its member offering The AIF provides a range of benefits that include financial health checks, a mentoring scheme, business affairs & legal support and digital marketing training. The organization also runs campaigns and initiatives in areas affecting its membership and organizes several member events such as this year’s inaugural Festival Congress, a two-day conference, awards and celebration of the independent festival sector, which took place in Cardiff last month. AIF co-founder Rob da Bank said: “I’m really chuffed to have reached our half-century at the AIF. To have 3 such diverse and fantastic festivals join us and take us over the 50 festivals mark is great news for the independent festival scene. The heritage and might of the Isle of Wight festival contrasting with the small but perfectly formed Fire In The Mountain and Farr festivals kinda sums up what we hope to do with AIF – cater for all the independent festivals out there whatever your size, musical bent and style. Roll on that 100th festival soon”. Isle of Wight Festival Promoter John Giddings (pictured) said, "It is a privilege to be accepted into the AIF to work alongside the great independents of the business. I hope that we can add something to the mix, and I know for certain that we will learn something new. We look forward to it!"